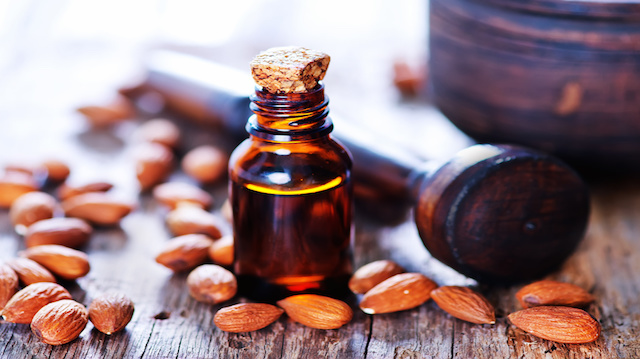 Sweet almond oil is often mentioned in DIY cosmetics recipes, but what are its benefits? Turns out this popular oil is more than just a pretty face — it also holds promise for healthy cooking and cardiovascular wellness. Almond oil has been used for millennia in Southeast Asia and the Mediterranean, where almond trees were first grown agriculturally. The people benefiting from this nourishing oil for generations didn’t need to analyze the particular vitamins and compounds contained within to know that it’s a superfood and an amazing natural cosmetic. Now modern science has been able to confirm that almond oil’s beneficial properties come from vitamin E, vitamin A, B vitamins, monounsaturated fatty acids, proteins, potassium, magnesium and zinc. Anti-inflammatory: Almond oil reduces inflammation when it is applied to skin and also when it is consumed. Antioxidant: The vitamins in almond oil supply antioxidant action to protect cells from damage. Detoxifying: Almond oil supports the liver in eliminating toxins. Emollient: Almond oil is a natural emollient, which means it soothes the skin and helps it stay moist and flexible. Sclerosant: Almond oil can be used to minimize vein issues such as spider veins, hemorrhoids and varicose veins. Laxative: When used internally, almond oil has a gentle laxative action to promote regular elimination. Analgesic: Almond oil can be used as a mild pain reliever, so it makes a great massage oil for sore muscles. Cicatrizant: Thanks to the vitamins contained within, almond oil helps wounds heal faster with less scarring. Almond oil comes in two varieties: bitter and sweet. The bitter type is made from wild almonds, which naturally contain a potential toxin called amygdalin. Cultivated almonds have been bred to have a sweet taste and to eliminate the toxins; therefore, the oil from these almonds is called “sweet almond oil.” This is the type that is used for consumption and cosmetic applications. Here are the best ways to make use of sweet almond oil in the kitchen, in the bathroom and in your makeup bag. Sweet almond oil is amazing for practically every hair concern. A dry scalp or dandruff can be relieved with a few treatments of almond oil rubbed into the scalp. Hair can be treated with almond oil for shine, detangling and prevention of split ends. And thanks to the magnesium content, almond oil may help hair grow faster. Try doing a hot oil treatment with almond oil once per week — simply warm up a few teaspoons of oil (depending on your hair length) and massage it on. Cover hair with a shower cap for two to three hours, then wash or rinse. Gorgeous hair doesn’t stop there — try using a little bit of sweet almond oil combed into the eyelashes for a lengthening and strengthening treatment. This is best applied before bedtime to allow it to soak in overnight. Almond oil is so gentle that it is the most recommended oil for babies. It absorbs well, making it the perfect oil for massage and for use after washing. The pleasant sweet and nutty aroma also makes almond oil an enjoyable choice. The antioxidant capacity of almond oil means that it works to heal conditions such as dry and cracked skin, eczema and psoriasis, and dandruff. All you need to do is apply a small amount of pure almond oil, optionally combining it with a few drops of essential oil suitable for the condition, like lavender or tea tree oil to soothe skin issues. The vitamin A content in almond oil may help fight acne, keratosis pilaris and rosacea. At The Alternative Daily, we are always putting food on our faces. The antioxidants in almond oil are ideal for protecting the skin from sun damage and reducing signs of aging. Using almond oil as a daily facial cleanser is a great way to remove dirt and debris without drying the skin. If you want to try oil cleansing with almond oil, start by moistening the face with warm water to open the pores. Apply a small amount of oil and massage into the skin. If you wish to exfoliate, you can scrub a little bit with a soft natural bristle brush or facecloth. Let the oil sit for a minute or two, then gently rinse and pat dry. The perfect amount of oil will remain behind to leave your facial skin feeling moisturized and supple with a subtle glow. Similarly, the oil can be used as a makeup remover that leaves skin clean without overdrying. Lips and nails also enjoy getting a little bit of special treatment with sweet almond oil. Lips can be softened with a moisturizing emollient treatment of almond oil mixed with honey, while cuticles and nails love to be massaged with a blend of sweet almond oil and shea butter. The same treatment is great for minimizing scars and stretch marks. Although using pure and natural ingredients topically is important, we can also gain health and beauty benefits from consuming them. Since almond oil is a mild laxative, adding a teaspoon to a smoothie can be a great way to gently cleanse the colon and promote regular elimination. The magnesium content may also help prevent cramping or pain in the digestive system and may relieve colic in babies. Sweet almond oil is a heart-protective healthy fat. The monounsaturated fat content has been found to lower harmful LDL cholesterol while raising healthy HDL cholesterol. Improving this ratio is said to reduce the risk of cardiovascular diseases. The minerals provided by almond oil help improve bone density to support a robust skeletal system. Other nutrients such as riboflavin, L-carnitine and phenylalanine are believed to improve memory and nervous system function. As always in shopping for healthy, natural products, it’s important to read the label and scrutinize the ingredients list. Check that you are buying 100 percent pure sweet almond oil, and that it is packaged in a dark bottle to prevent oxidation. Glass is the best packaging material to preserve freshness. Ideally, you will be able to find a brand that uses organically grown almonds and employs a cold-pressing process (without heat or solvents) to extract the oil. Now that you’re up to speed with all of the awesome benefits of sweet almond oil, why not try incorporating it into your natural beauty regimen and even adding it to recipes. Find out more about natural beauty treatments and avoiding toxins. Hey Buddy!, I found this information for you: "Better Skin, Hair and Overall Health: All Thanks to Sweet Almond Oil". Here is the website link: https://www.thealternativedaily.com/better-health-with-sweet-almond-oil/. Thank you.